Aaagh! I had hoped to have a really great celebratory post today. Roots, our favorite vegan-friendly grocery store, was hosting a small vegan festival at the location closest to us. The store is also somewhat close to the facility where I’ve been visiting my hospice patients on Saturday mornings, so I figured that I’d hit up the festival after my visits (instead of swinging by the farmers market like I usually do). I planned to snap some photos of the exhibitors and vendors, pick up a yummy lunch for Steven and me, and maybe get one of the swag bags they were handing out to the first 100 visitors. Final celebratory post done and dusted. As I drove home, I pondered what to post about while trying not to get too annoyed that I’d missed the farmers market for this bust. Hmm… maybe Steven and I could switch our plans, take advantage of the warm weather, and go somewhere for lunch. We could sit outside and I could share something about the simple joys of a good meal on a nice day. But then I looked at the clock; it was already nearly 1 p.m. and there was no way we’d get out to lunch and back again by 2. Why did we need to be back by 2? Well, Verizon (our internet service provider) accidentally cut our internet yesterday (Friday) while doing work next door (…) and couldn’t send someone out to fix it till “between 2 and 4 p.m.” today, Saturday. Yes, they broke our internet and couldn’t fix it for 24 hours. Steven works from home (…using the internet…) so his Friday afternoon was a bust. I was pretty livid that Verizon couldn’t send anyone sooner and contacted customer service on Twitter and on their website, but of course they couldn’t change it. Anyway, home I went, where I whipped up a quick quinoa and sweet potato dish while we waited for Verizon. I typed up this post (internet-less) and thought about what else to share. Why not talk about vegfests of the past? This year, the Washington D.C. VegFest was cancelled when Hurricane Florence threatened to wreak havoc and D.C. declared a state of emergency. For a few days we waited for the storm to hit, but then it… didn’t. The Saturday of VegFest dawned clear, sunny, and perfectly temperate. A real bummer. Though I don’t go every year, this would’ve been the perfect day for it! We also sometimes visit Baltimore VegFest, including a couple years ago when my mom flew in for the weekend to join us. Though a smaller event than the one in D.C., both feature speakers, exhibitors, vendors, and looooots of food. We’ve enjoyed sandwiches from Nourrie’s Cuisine (a vegan catering company that just opened a restaurant (!) in Baltimore), soul food from NuVegan Cafe, and coffee from Brewing Good, among other delights. 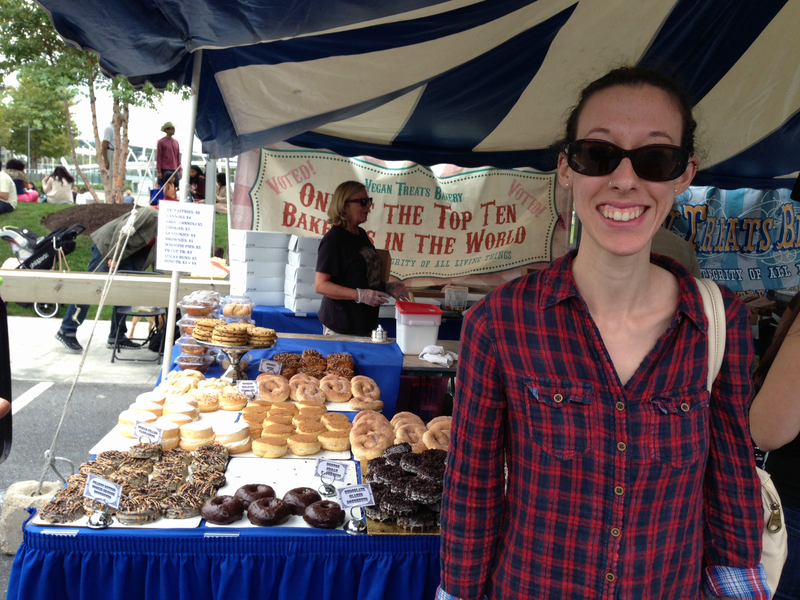 Back when we lived in Madison, we attended the first-ever Madison Vegan Fest. It was so long ago that the details aren’t clear to me anymore, but it was indoors and a bit small. Now, though, it looks like it’s grown quite a lot. For new vegans especially, I think vegfests are great ways to feel like you’re part of a community, stock up on veg goods (especially since Herbivore Clothing often exhibits at the big ones! ), and try local vegan-friendly dining options. While I don’t make it a point to attend every local one anymore, I still like stopping by to re-energize my vegan batteries. :) Do you have any local vegfests? We just had our vegfest in Phoenixville, PA, today! And of course, I stood in line for Vegan Treats! I actually haven’t been to a vegfest yet. I think I am super hesitant because you have to pay (usually) to get in, then you pay for the food. I understand the logistics, but I don’t have the current cash to do it I guess. Oh, that’s interesting! All the ones I’ve gone to have been free. Yeah, I probably wouldn’t pay an entrance fee.